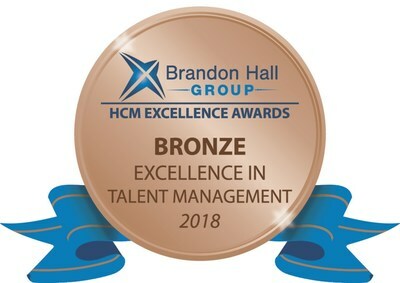 HOLMDEL, N.J., Sept. 13, 2018 /PRNewswire/ -- WorkWave®, a leading provider of cloud-based software solutions for the field service and last-mile delivery industries, today announced that it has been awarded a Brandon Hall Group Bronze Award for Excellence in the Best Advance in Talent Management Technology Implementation category for its roll out of Caliper and Caliper Analytics. WorkWave partnered with Caliper to implement Caliper Analytics to guide its talent management decisions. As a result of WorkWave's rapid growth at all levels of the company, its leadership became aware of a clear need to facilitate objective conversations around development processes and ways to support its managers to have more constructive conversations with their direct reports. The Caliper Analytics platform enables WorkWave to leverage detailed personality data to develop new and existing employees, help managers have more effective conversations and fill roles in a rapidly expanding organization. "As WorkWave continues to place an emphasis on becoming the leader in field service management technology, it is critical that we hire and develop passionate and talented employees who possess the right skill sets for the right positions," said Marne Martin, CEO of WorkWave. "Through the use of Caliper Analytics, our talent team has been able to take a data-driven approach to WorkWave's recruitment and development, allowing us to ensure that each person we hire is a great fit." "We are thrilled that our partnership with WorkWave has been recognized by the Brandon Hall Group, as we continue to provide them with a scalable, data-driven solution to support the company's growth and market strategy through its valuable employees," said Jacque Casoni, Vice President, Mid-Atlantic Region at Caliper. The award entries were evaluated by a panel of independent senior industry experts, Brandon Hall Group analysts and executives based upon the following criteria: fit the need, design of the program, functionality, innovation and overall measurable benefits. "Excellence Award winners personify innovation that drives business results. Our winners embrace the future and embrace change and the challenges that go with it," said Rachel Cooke, Chief Operating Officer of Brandon Hall Group and head of the awards program. "It is amazing in reviewing these entries how organizations – both large and small – work across functions to make human capital management a valuable asset that enables business success." WorkWave, a division of IFS, provides comprehensive field service management solutions that connect every facet of a business through its unified, easy-to-use platforms. The company's suite of solutions allows field service professionals across industries to easily attribute and automate sales and marketing activities, improve back office efficiency and increase their visibility into field operations through its mobile solutions. WorkWave's platforms provide over 8,000 customers an unprecedented level of business insight and information, enabling them to increase efficiency, increase revenue and provide an exceptional customer experience. Founded in 1984, WorkWave has been recognized with multiple awards for its outstanding products, growth and culture, including the Inc. 5000, SaaS Award, IT World Awards and Best Place to Work by NJBiz and Inc. Magazine. For more information, visit www.workwave.com. IFS™ develops and delivers enterprise software for customers around the world who manufacture and distribute goods, maintain assets, and manage service-focused operations. The industry expertise of our people and solutions, together with commitment to our customers, has made us a recognized leader and the most recommended supplier in our sector. Our team of 3,500 employees supports more than 10,000 customers worldwide from a network of local offices and through our growing ecosystem of partners. For more information, visit: www.IFSworld.com. Caliper provides talent-management solutions to help businesses align talent with strategy, hire better people faster, and develop leaders, teams, and mission-critical employees. Caliper partners with all types of organizations, from Fortune 500 companies to small businesses, and from government agencies to non-profits. HD VoIP â€“ Breaking the Sound Barrier?